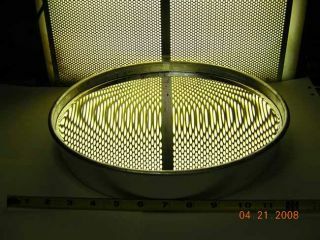 A 12-inch parabolic moondust mirror made by spincasting. The mirror consists of a bottom layer of lunar soil simulant JSC-1A Coarse mixed with a small quantity of carbon nanotubes and bonded with thinned epoxy. Telescope mirrors made from lunar dust could help realizedreams of stargazing from the far side of the moon. Creating gigantic lunar telescopes would normally carry anastronomical price tag, but NASA researchers used a mix of epoxy, simulated lunardust and carbon nanotubes to demonstrate how to use materials already found onthe moon. ?You can go to the moon with a few buckets, and buildsomething far larger than anything a rocket can carry,? said Peter Chen, aphysicist at the NASA Goddard Space Flight Center in Greenbelt, Md. Astronomers have argued about which is better in the future:building additional orbiting space telescopes such as Hubble or setting them upon the moon. Both types oftelescopes would be beyond the interference of Earth?s atmosphere, althoughthe moon has the added advantages of being a stable platform with a far sideshielded from Earth?s cluttered radio background. On the other hand, getting tothe moon represents more of a challenge than simply launching a spacetelescope. However, the debate so far has been ?limited by launchingfrom the ground,? Chen told SPACE.com, because Earth?s gravity placesboth size and cost limits on what rockets can carry into space or to the moon. The solution: Get much of the needed building material fromthe moon itself. Chen had already started working with epoxy and carbonnanotubes to create ?smart? materials that can flex or change shape when anelectric current passes through, but ended up adding simulatedlunar dust called JSC-1A Coarse Lunar Regolith Simulant to the mix. Chen used the resulting lunarconcrete as the foundation of a foot-long disk, and poured more plasticepoxy on top of it. Then he spun the mirror at a constant speed that formed theepoxy into a parabolic, slightly bowl-like shape as it hardened. The mirror?sfinishing touch came with a thin layer of reflective aluminum applied inside avacuum chamber. Making a Hubble-sized mirror would require bringing 130pounds (60 kg) of epoxy to the moon with 3 pounds (1.3 kg) of carbon nanotubesand less than 1 gram of aluminum, according to Chen?s calculations. Meanwhile,1,300 pounds (600 kilograms) of lunar dust could provide the bulk of thematerial. The moon?s lack of atmosphere also suits the vacuum conditions neededto make the mirror. Astronomers may imagine telescope mirrors half the size of afootball field, but realizing such dreams depends heavily on whenever NASA returnshuman explorers to the moon and sets up a moon base. Other challenges include getting the necessary manufacturingequipment to the moon, such as the spinning table on which the mirror getscreated. Future astronauts would also have to ensure that none of thefree-floating lunar dust contaminates the mirror. "It?s a great idea in principle, but nothing is simpleon the Moon," said James Spann, physicist heading the Space andExploration Research Office at Marshall Space Flight Center, in a NASAstatement. Chen and his colleagues will try to scale up theirdemonstration by creating 1.64-foot (0.5 meter) and 3.28-foot (1 meter) mirrorsusing the simulated lunar dust. They also plan to figure out ways to hone thequality of the finished mirror?s surface, and are already speculating aboutways future explorers and robots could build even larger telescope mirrors onthe moon — perhaps within an impact crater. ?It?s totally out-of-the-box, but it?s fun to think about,?Chen said.